1 . Check the gas meter has not been turned of accidentally or run out of credit if a prepayment meter. The number of times the gas lever has been found accidentally in the off or partially off position is surprising to clients. 2. Press reset button upto 3 times just in case it is a one off occurrence, and keep an eye on future occurrences. 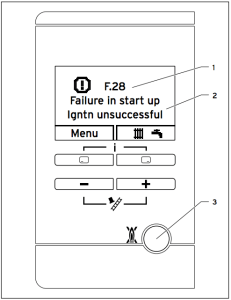 Vaillant Ecotec New F28 , No 3 Reset Button. Disclaimer: Above video is by Worcester Bosch and some parts may not be applicable to your boiler. Following are the likely chances of certain faults from high to low. ~39% chance of the gas valve being at fault. F28 Please note,a qualified gas engineer is required to work on gas appliances, however basic checks such as making sure the gas is turned on can be carried out by home owners or tenants. If you are looking for an engineer to carry out a repair on your boiler, feel free to use the Vaillant Pro finder section on our website. 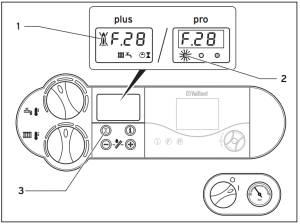 Remember Vaillant Pros can diagnose F28 problems quickly and efficiently.